As the automotive industry recognizes the Chevy Volt plug-in electric vehicle as Motor Trend's Car of the Year, the Steel Market Development Institute (SMDI) is celebrating the record use of high-strength steel in the vehicle structure. Motor Trend called the Chevy Volt "some of the most advanced engineering ever seen in an American car," as it announced its selection yesterday on www.motortrend.com. 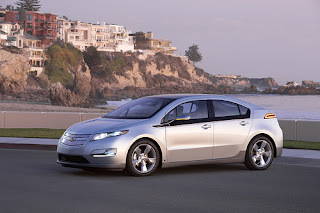 According to General Motors, the Volt combines advanced steels to help ensure crashworthiness and stiffness. With over 70 percent of its total structure made from high-strength steels, including advanced and ultra high-strength steels, the Volt's steel design provides occupants with added protection. In addition, the Volt features a pressurized steel fuel tank. "The Chevy Volt utilizes lightweight, advanced high-strength steel technologies that complement its revolutionary steel design and add to its technical appeal as this year's Motor Trend Car of the Year," Ron Krupitzer, vice president, automotive applications for SMDI, said, "GM's innovative use of advanced steels has resulted in a vehicle that is affordable, safe, durable and energy efficient." Motor Trend's Car of the Year is a week-long process that includes a number of performance, ride and handling, and driving tests. In addition, contenders are evaluated in the following areas: advancement in design; engineering excellence; efficiency; safety; value; and performance of intended function.